Here’s how an inverter works in this computer: Input is a pipe connected to the upper chamber. Incoming water (representing one) fills the upper chamber to float the ball. As the ball floats, it lifts the flap and drains water out of the lower chamber. Output is a pipe connected to this chamber, so any water is drained from output pipe as well. This absence of water represents zero, inverse of output, thus this box is a water NOT gate. 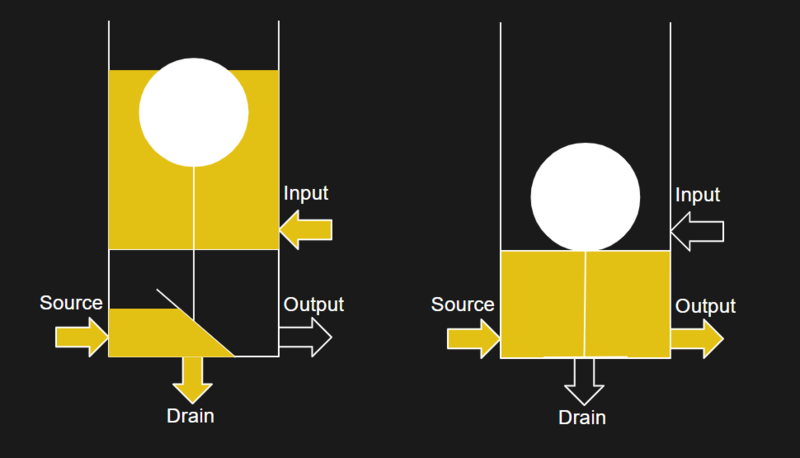 Front of water computer inverter, with input (top) and output (bottom). Rear of water computer inverter, with source visible and drain not visible below the flap. As a Maker Faire exhibit, [Glen]’s water computer appeals to all audiences. The colorful boxes and soothing sound of flowing water makes this water feature an appealing piece of kinetic art. Young children are happy to help power the computer, filling buckets of water from drain tanks and lifting them up to refill source tanks. Those with electronics knowledge can see concepts illustrated with water. Not just basic ideas like “source” and “drain” but also more advanced concepts like “leakage current” and “threshold voltage”. Each length of pipe connecting boxes represents wire capacitance, the flow rate of water dictates switching speed, the list goes on for this surprisingly faithful educational model of NMOS logic. Building this project with his children was certainly a great way to help explain daddy’s career as a chip designer. With all the effort put into this creation, it’ll surely resurface again in another venue. [Glen] hopes to exhibit this water computer again at Bay Area Maker Faire 2019 in San Mateo. By then it should feature a few improvements like streamlined setup, teardown, improved reliability, and better documentation to make debugging easier when things go wrong. A quick recovery is desirable after overzealous children pulled a bunch of pipes sending water shooting everywhere. For now, those still wondering how two tables full of floating ping-pong balls can perform computation could seek our guide Make Logic Gates Out Of (Almost) Anything. And finally, a Hackaday salute to all the parents and educators for your effort teaching future generations… which occasionally means being soaked with water by the end of the day. Obviously it would require and external device (human with a timer). That looks very fun to run! I remember “fluidics” was very trendy in the 80s. Until, that is, they discovered that fluids tended to move a lot slower than electrons and your MIPS was well below 1. Automatic transmissions used fluidic logic to shift, until Toyota started building electronic ones. What an improvement! Chrysler/Dodge had quite a big problem with their electronic transmission module as well in the early 1990’s. All manufacturers have those problems because after some time the hot ATF creeps through the sensors/insulation/wires and ends up in the connectors and control units. If you don’t know a good garage where they know how to fix those things you end up with bills for thousands of bucks. Maybe that is what happened with my wife’s 2011 Outback. Being nuke proof I imagine the military uses them as well. Great work ! Very easy for children and non technical people to “connect” with the concepts as you see the water flowing. It reminds me of: https://hackaday.com/2016/04/26/retrotechtacular-moniac/ the pioneering work of economist William Phillips, very useful for education and experimentation with simple economic models. A water molecule has a diameter of approx. 0.29 nm. So we could still use water in 7nm technology. That’s supposing we aren’t using liquid helium fluidics at that scale. I’m in love with this build. The flow of logic through a system is so abstract to understand, but here you can very easily watch the different cells fill up and it’s slow enough you can walk backward through the process and get a second try at understanding how the current operation is being performed. Excellent hack! It’s a fully pipelined processor. Bubble in airline = cosmic radiation “flipping” a bit ? Pleeeeeease make one with mercury! So, it’s a “ripple” adder ??? ?